3CX WebMeeting brings online collaboration to a whole new level as it allows you to interact with your customers and colleagues more regularly and easily whilst boosting your productivity by sharing and working on documents as a team, in real-time. 3CX WebMeeting gives you the freedom to do almost anything that you can do in person, with the added benefit of getting business done faster, whilst still dealing with your customers face-to-face. If your customer needs to meet you but you’ve had to jet off to another country, 3CX WebMeeting brings you together in seconds and in high definition video and audio. It can be difficult if you need to coordinate a project quickly that involves three different departments, and a nightmare if those departments are based off site. With 3CX WebMeeting, online collaboration has never been easier. Schedule a video conference with the marketing team in London, logistics in New York and the sales team in New Jersey and share your screens, files and even take control of a participant’s computer! Try out 3CX WebMeeting today! Download 3CX Phone System and enable 3CX WebMeeting. Or download the on premise version, 3CX WebMeeting Server. Call Clarity Technologies Group, LLC at 800-354-4160 for more information or to schedule a demonstration today! The Constitution of The United States of America – does not afford anyone the right of privacy. Preamble We the People of the United States, in Order to form a more perfect Union, establish Justice, insure domestic Tranquility, provide for the common defence, promote the general Welfare, and secure the Blessings of Liberty to ourselves and our Posterity, do ordain and establish this Constitution for the United States of America. This great document that all of our laws are built upon does not contain the word “privacy” anywhere within its writings. Instead, a virtual (or hosted) PBX takes the burden of acquiring and keeping up with telecom equipment off your shoulders and allows you the freedom to easily expand your phone system as you grow. And with access to the vast resources of your provider, your small business can anticipate being able to offer features consistent with those of a major enterprise. Your virtual provider will house the IP-PBX equipment, as well as the technology, required to provide telephony services. An on-site router connects through an IP-PBX server at the provider’s location. These are the same IP phones in both cases, except the phones plug into the on-site router when you have a hosted system. The provider handles calls, signaling and features through its IP-PBX server. Besides relieving your business of these infrastructure encumbrances, hosted PBX offers other benefits such as minimal IT support, financial respite, continuity in the face of power outages, and robust features (e.g., videoconferencing and instant chat). Uncomplicate your business telephony today by investing in a hosted PBX phone system. Call Clarity Technologies Group, LLC at 800-354-4160 to find out how you’re hosted or cloud PBX can be secured redundant Tier 1 data centers. Our data centers are US based and we also have data centers in the UK and Australia. Could this escape have been thwarted with MOBOTIX cameras in each cell? (CNN – June 8, 2015) There’s almost no doubt someone helped the killers get out. The question is who. The question that is nagging at me is, “could MOBOTIX cameras in each cell have prevented such a brazen escape?” MOBOTIX cameras have a specific mount designed just for high security areas such as prison cells. The prisoner is monitored by a bullet proof, camera that can not be gripped, moved or damaged. Color images are recorded with any movement by the prisoner. Additionally, all sounds are captured with the video. This evidence is watermarked and easily played back by. Real time monitoring of certain cells would have certainly yielded a good picture of two men working on cutting through a steel cell wall. In Bergen County NJ the County Jail uses MOBOTIX D-12 cameras throughout the lockup. Bergen County purchased 80 cameras, with most of those being used at the jail and the others at the courthouse. With both indoor and outdoor locations, the complete variety of MOBOTIX cameras are on the job. The original estimated amount of cameras was significant reduced by the use of dual lens D-12 cameras and Hemispheric Q-22 cameras with 180 degree views. The reason for that clarity is that MOBOTIX provides fully digital, intelligent IP (digital) video camera systems, not (converted) analog CCTV cameras. Instead of the typical 288 vertical lines of resolution recorded by DVR’s, MOBOTIX cameras record up to 1536 lines/3 megapixels of resolution, which is 30 times more than the analog standard currently offered in the industry, and even more than HDTV. Bergen County had particular concerns related to the extreme cold in the winter and how that could affect outside cameras. MOBOTIX cameras are built to withstand all sorts of weather conditions and hostile environments: from -30 to +60 °C (-22 to +140 °F) without additional cooling or heating, allowing Power over Ethernet (PoE) all year round. The fiberglass reinforced and shock-resistant MOBOTIX cameras protect the network cable and connections against vandalism as well as severe weather conditions. There is no worry in this case about deterioation due to camera lenses fogging over, or the system getting damaged from the rain, heat or cold weather. The fact that MOBOTIX cameras have both audio and video features introduces an interactive aspect that is a big advantage for Bergen County. “In a corrections setting, you need to see and hear what’s going on, so this works very well for us,” said Phil Lisk. MOBOTIX cameras can also be programmed to give an audio alert that warns inmates, guards or other employees away from particular areas. The dual lens feature of MOBOTIX cameras serves the Bergen County Jail’s need to cover very large areas. It is essentially like having two cameras for the price of one with the added advantage of being able to view much wider or two separate areas. In addition, MOBOTIX is able to do this with no moving parts. Because MOBOTIX systems provide 30 times more detail than the average analog camera, one MOBOTIX camera can watch multiple targets and thereby reduce the total number of cameras required. Intelligent, direct storage management on an NAS or fileserver elliminates the need of digital video recorders and reduces the overall cost of storage by a ratio of 10 to 1. The original estimated amount of cameras was significant reduced by the use of dual lens D-12-Di cameras and Hemispheric Q-22 cameras with 180 degree views. Clarity Technologies Group, LLC is proud to be a MOBOTIX Advanced Partner and is available to consult on either retrofit or new installations of MOBOTIX cameras. Call Clarity Technologies Group, LLC at 800-354-4160 for more information. When you’re in charge of running a four-star hotel that’s known for its high level of customer service, your chief concern is maintaining the status quo and hopefully capitalizing on it in the future. At least this was the top priority for the staff at Ramada Plaza Antwerp Hotel until its legacy phone system started to get in the way of internal communications. As such, the IT team at the hotel concluded that a newer feature-rich and cost-efficient solution was in its near future—something like an IP-PBX phone system from 3CX, which was its ultimate choice. The hotel said good riddance to its days of using on-premises infrastructure and adopted a robust suite of unified communications (UC) features. Software-based phone systems make the adoption of UC simple, as the installation and configuration all takes place on a familiar computer-based interface—specifically on a Windows interface for 3CX. Now, the hotel can interact with remote locations through Web conferencing or collaborate internally on the fly with instant chat. On-premises infrastructure requires hardware that causes businesses to absorb exorbitant fees. In the case of the Ramada Plaza Antwerp Hotel, these funds could be well-spent elsewhere—like in expanding office locations. Implementing an IP-PBX system enabled the business to slash its telecom costs while gaining more functionality. In the end, Internet telephony is capable of providing significant ROI so that companies can focus on business imperatives other than their phone system. Another asset the hotel enjoyed was the ability to seamlessly connect multiple offices. For instance, the hotel simply added phone bridges—which are used for connecting remote locations—from a drop down menu on the phone system’s Windows-based interface. Connecting multiple locations in a snap is one the greatest advantages of an IP-PBX, as you can grow your business and scale your phone system at the drop of a hat without undergoing downtime from the addition and reconfiguration of on-site phone wires. You don’t have to be an ideal travel destination like the Ramada to reap these kinds of benefits. A phone system upgrade to IP-PBX will benefit your business no matter its location or size. Clarity Technologies Group, LLC has installed several Hotel IP- PBX’ for clients including Intercontinental Hotel Group and other fine properties. Call Clarity Technologies Group, LLC at 800-354-4160 today for more information on how 3CX IP-PBX can interface with your hotel or hospitality needs! Small and Medium Businesses (SMB) are now implementing more mission-critical processes in a cloud/hosted environment. Applications like email, CRM, Unified Communication, Premise Security, and ERP can all be implemented more effectively utilizing a third party provided accessed over the internet. However, many SMBs are implementing these solutions without taking the steps necessary to ensure that their connection to their provider is redundant, reliable and secure. With so many services and applications being accesses over the internet, a failure of the connection to the internet could cause business to grind to a halt. Other SMBs are resisting moving any critical services to the cloud for this very reason. DrayTek routers feature mutli-WAN capabilities with Load Balancing and Failover. Models are available for both Dual- and Tri-WAN. DrayTek has the perfect solution with these multi-WAN routers. With these routers, services like DSL, Cable, metro Ethernet or Fiber can be combined to create a redundant connection to the Internet. Selected DrayTek models also support 3G and 4G LTE WAN connections. The routers can be configured for failover or a load balanced implementation. In addition to WAN failover, DrayTek Multi-WAN routers support true load-balancing. This way additional bandwidth from secondary WAN is aggregated and not just sitting idle. DrayTek routers are sophisticated enough to recognize and remember sessions and perform Session Load balancing. 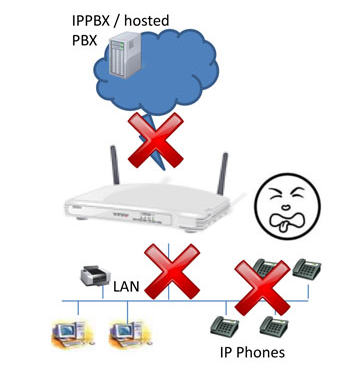 Stateless Packet load balancing would break VoIP, HTTPS and other protocols. These and other fine DrayTek routers are available at Clarity Technologies Group, LLC – Call 800-354-4160 today for more information or to order your new DrayTek Router! Robert Messer, President of of ABP Technologies explains the simplicity of DrayTek multi-wan functionality. Small and Medium Business as well as Enterprises are now implementing more mission-critical process in a cloud/hosted environment. Many times, VoIP and Unified Communications is the first application that is moved to the cloud. However, many find out the hard way that VoIP does not always produce pristine calls when the available bandwidth is not effectively managed to ensure VoIP call quality. The bandwidth required by other applications and services can negatively impact voice quality. For example, a sync triggered for a Dropbox account could create a spike in bandwidth usage and cause existing VoIP calls to experience packet drop. Conventional QoS does not resolve the problem as the router needs to understand VoIP and effectively manage and prioritize the traffic. Draytek has implemented an innovative VoIP QoS technology with an algorithm designed to preserve VoIP calls quality bydynamically discovering VoIP calls and throttling other traffic to always ensure that there is bandwidth for the next call. Even the most advanced traffic shaping solutions in the market can take few seconds to throttle traffic,(especially inbound traffic) when more bandwidth is needed for VoIP Calls, momentarily affecting VoIP quality across the system. This unique approach, ensures VoIP quality at all times while minimally impacting available bandwidth when there are no calls in progress. The DrayTek solution can be implanted to reserve bandwidth for the next two calls if traffic dynamics demand it. In the past, configuring this type of QoS plan required a great deal of network knowledge and device specific training using a command line interface or a rudimentary GUI. Experience with technologies, protocols or terms such as DiffServ (Differentiated Services), CoS (Class of Service), 801.1p, and ToS (Type of Service) were required for properly implementing a QoS solution. In addition, a traffic shaping router needed to be configured for classes and buckets, priorities, policies and speeds. Moreover, classifying VoIP traffic presents additional complexity as the RTP (Real Time Protocol) traffic, which carries the media, runs on UDP ports that are negotiated on the fly within the SIP/SDP signaling. In an SMB, where the main objective for implementing QoS is preserving VoIP / SIP calls quality, this type of set-up can be overly complicated and beyond the skill-set of most SMBs. DrayTek has made it very easy to configure VoIP QoS. Set-up can be accomplished by anyone with minimal technical knowledge. Set-up of QoS is as simple as ticking a checkbox and defining the SIP port. When enabling DrayTek’s VoIP QoS, everything is automatically setup in the background. The DrayTek engine is capable of recognizing the SIP signaling and associate the media stream (RTP) to it. Traffic shaping algorithms explained automatically detect and manage VoIP calls for perfect QoS with just two clicks. Clarity Technologies Group, LLC is a certified Dray Tek partner. Call Clarity Technologies Group, LLC today for more information on the entire Dray Tek line today at 800-354-4160 ! Dial codes are key/number combinations used to access functions within the phone system directly from the phone. The administrator can change these from the 3CX Management Console > Settings > Advanced > Dial codes tab. This section will describe the default dial-codes. This will redirect the active call from the specified extension to your extension. You can also retrieve a call from a ringing extension without specifying the extension number. To do this, type *20* followed by the send key. This will redirect the first available active call to your extension. Important: Intercom is disabled by default for security reasons. If you want your phone to Auto-answer 3CX Make Call requests (when the phone does not support CTI like the Cisco SPA series) you need to configure a dial code in the 3CX Phone System Settings >> Advanced >> Dial Codes tab. This Dial code must be unique and must not conflict with any of the other dial codes. The Billing Code feature’s default value is **. This allows you to add a tag to a call you want to make. Instruct the 3CX Phone System to fall back to the configured global office hours at that particular day and time. Let us assume that the administrator configures this dial code to be *64. Let us also assume that the global office hours are set from 9am till 5.30pm. If the Administrator dials *641 (appends a 1 to the code), a prompt will be played stating that the “3CX Phone System is now set to IN OFFICE HOURS”. This means that the 3CX Phone System will disregard the current time, or day (even if it is a holiday) and set all the routes of the Gateways, VoIP Providers and DID/DDI’s to route to the In Office hours destination. If the Administrator dials *642 (appends a 2 to the code), a prompt will be played stating that the “3CX Phone System is now set to OUT OF OFFICE HOURS”. This means that the 3CX Phone System will disregard the current time, or day (even if it is 10am for example) and set all the routes of PSTN Gateways, VoIP Providers and DID/DDI’s to route to the Out of Office hours destination. If the Administrator dials *64 (with nothing appended), a prompt will be played stating that the “3CX Phone System is now using the DEFAULT OFFICE HOURS”. This means that in this example, the 3CX Phone System will override the previous 2 commands and behave as follows – from 9am till 5.30pm lines/ports will be routed to In Office Hours destinations and from 5.31pm till 8.59am, the lines/ports will be routed to the Out of Office hour destinations. Note: For the Mobile Transfer Service to work, the option “Ring my extension and my mobile at the same time” must be enabled in the extension’s properties. This service provides the ability to make transfers using DTMF inputs so you can effectively make transfers from your mobile phone. Available only in CCE or 3CXPSPROF Edition. This video demonstrates the ability of MOBOTIX Cameras to work in places most cameras simply cannot adapt to. MOBOTIX cameras were installed in the harsh mining conditions. Temperatures of more than 60’C causing many other cameras to struggle but not MOBOTIX. The low power consumption and in built VMS function allows for mobile surveillance on the min cart. Innovation at it best! This video was shot completely using only the natural light available in the mine with the MOBOTIX camera. Call Clarity Technologies Group, LLC today at 800-354-4160 to learn how to use MOBOTIX cameras in your harsh environment! Want to save your SMB from an unneeded cash drain? Then your first step in the right direction is investing in a business phone system that is cost efficient, simple to maintain and won’t require on-premises equipment. As such, implementing a virtual PBX as your SMB’s main phone system can not only help you save money, but it can also augment your new business venture by providing substantial ROI, smooth integration and top-notch collaboration features. When a proprietary PBX needs a repair or an update you might find yourself looking at an exorbitant repair bill due to its on-premises copper wiring. In contrast, a virtual PBX operates from a software-based infrastructure, which, unlike proprietary PBX systems that have a physical infrastructure, will require fewer maintenance and repair costs. In addition, virtual PBX is easily managed—anyone who can use a desktop or a laptop computer will be able to operate on this software-based PBX. As well, it’s simple enough that you won’t need to provide your staff with additional training to use it. 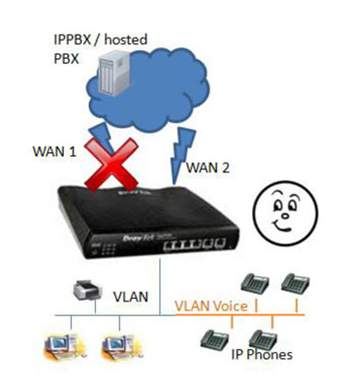 With a simple Internet download, you can integrate a virtual PBX into your SMB. Conversely, a proprietary PBX—with its complicated wiring and complex infrastructure—is difficult to implement. What’s more, if you wish to scale with a proprietary PBX, you have to add expensive hardwires and undergo downtime due to on-site installation. A virtual PBX, in contrast, allows you to scale your phone system straight from its computer-based interface, enabling users to connect to external office locations and add extensions at no additional cost. A virtual PBX allows you to take advantage of tools like Web conferencing, for example, when you integrate unified communications (UC) into your system. As such, SMBs gain more collaboration tools for a portion of the cost of a traditional phone system. In addition, tools such as instant chat can be used to communicate in near real time with remote employees, and thus enhance company synergy. So, preserve your finances and choose a phone system that will give your Small or Medium sized Business the greatest bang for its buck. Call Clarity Technologies Group, LLC today for more information on ClarityCloud, powered by BVoIP at 800-354-4160!